Sarvam Thaala Mayam is an upcoming music genre film starring G.V.Prakash Kumar, Nedumudi Venu, Vineeth, and Aparna Balamurali in pivotal roles. ‘Sarvam Thaala Mayam’ is a well written and relaxing musical, a genre that we rarely experience in Kollywood industry. It is a complete package-plot is amazing and real, the characters are simple and unbelievable, the acting is outstanding, background scores are superb and the direction is genius. Director Rajiv Menon, who is back after his 18 years’ penance gave a brilliant movie that largely depends on two powerful characters – Peter Johnson (G.V. Prakash Kumar) and Vembu Iyer (Nedumudi Venu). The story of the film revolves around Vembu Iyer, a veteran Mridangam expert, who find it difficult to adjust to the changes in the modern day music industry. Peter Johnson wants to break the stereotypes and excel in the world of Carnatic music, which is being controlled by the upper-class community. After mutually cherishing each other’s talent, these two zealous musicians understand that music is omnipresent (Sarvam Thaala Mayam). 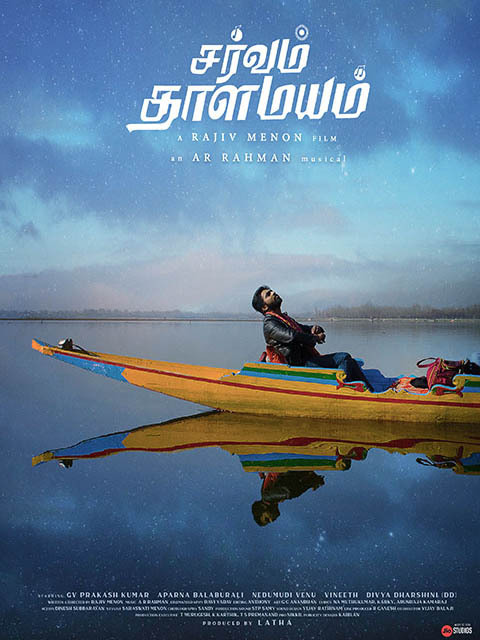 Usually in the majority of music genre films, the issue would happen between the guru and his shishya but in ‘Sarvam Thaala Mayam’ despite their dissimilar upbringings, they have mutual respect for their talents which makes this movie a success. All the stars in the movie are chosen perfectly, making it a brilliant film. Nedumudi Venu does justice to his role of mridangam vidwan Vembu Iyer. His ego, dialogues with the disciples, exasperation, quirkiness and small subtle moments are a delight to watch. It is surely an another milestone in this veteran’s acting career. G.V. Prakash Kumar is genuine and earnest! Being a music director himself, the way he handled the instruments in the film looks natural. He has improved a lot as a performer. The fans will surely love the innocent boy-next-door Peter and that is the biggest plus for the movie. Kumaravel, who portrayed the role of G.V. Prakash Kumar’s dad gave a tremendous performance. Actress Aparna Balamurali is a promising new face and Dhivyadarshini as the TV anchor is a perfect casting choice. The biggest strength of the movie is that the director has portrayed the music scenario in our state in a genuine manner. His characters are not perfect, but they come with their natural flaws just like anyone of us. Though the character of Mani (Vineeth) has grey shades, it is the beauty of director’s writing. He has portrayed the emotions of his stars and their situations in a clear and brilliant manner. On the whole, the direction is brilliant. The reality show scenes are a bit forced and the journey of Peter to learn different music forms is portrayed in a hurry, which can be shown with more depth. But these are superficial flaws in an otherwise refreshing, beautiful and moving experience. One can say that ‘Sarvam Thaala Mayam’ is the best work of AR Rahman in recent years. He shines in tracks like ‘Sarvam Thaala Mayam’ and ‘Dingu Dongu’. The background score of the movie is also mesmerizing. Cinematographer Ravi Yadav has captured the emotions of his characters in a beautiful manner. The flow of the film is quite organic thanks to the editor Anthony. The run-time is 131 minutes. On the whole, ‘Sarvam Thaala Mayam’ is the best music genre film in Kollywood till date.